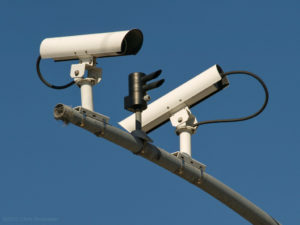 Many of you may notice during your daily commute, the small cameras perched atop the streetlights in an intersection. People often confuse these with speed cameras. 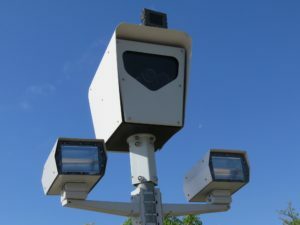 Speed cameras are usually larger than Vehicle Detection Cameras and are typically accompanied by some sort of flash or lighting system as depicted in the photo to the left. Vehicle Detection cameras however are usually much smaller and do not have lights as shown in the picture to the right. They are used to detect when vehicles arrive at an intersection and subsequently change the active green or red phase. If no vehicles arrive, the phase is then set to maintain its maximum cycle or holding pattern as predetermined by the engineering protocols. Using Vehicle Detection allows the main road to stay green for the maximum amount of time or until a vehicle arrives on the side street. Typically, one camera is assigned a particular lane for each direction, this usually equates to four cameras per intersection. The cameras the are then assigned a manually inserted detection zone within the software that recognises when a vehicle enters. The phasing then adapts accordingly relative to the arrival of vehicles. This technology is especially useful for busy corridors or high congestion areas. In addition to vehicle detection, these cameras, with the proper software, can be utilized for many different data collection options. A few examples of these would be traffic volumes, people per car, frequency of left turns and so on. This data can be vital in determining the future needs of the intersection to optimize traffic flow. Detection equipment such as these will become more and more prevalent with the onset of smart signals. So the next time you are driving and see one of these cameras, fear not, they are there to help keep you moving and are in no way associated with traffic violations.